If we set aside our views on Brexit for a moment and try to look at Jeremy Corbyn's decision to sack Owen Smith for publicly criticising Labour's six tests position from a reasonably objective stance, it's obvious that Smith had to go. Love them or loathe them Tony Blair and Margaret Thatcher were strong leaders, as were Winston Churchill and Clement Attlee in the mid 20th Century. It's inconceivable that any of these strong leaders would ever have allowed a member of their cabinet to publicly defy the party policy to set out their own personal policy in a newspaper article. Any cabinet member who did that, would have been sacked, and rightly so. The problem of course is that after eight years of shockingly weak leadership under the Tories, people have got used to the government behaving like a total rabble, where gross incompetence is the norm, and with ministers regularly making up policy on the hoof and getting away with it. So when they see a party leader actually imposing discipline it comes as a shock to them. Things were bad enough under David Cameron, whose tolerance to the incompetence of his ministers was so extreme that George Osborne and Theresa May survived easily despite six years of endlessly missed targets and hopelessly botched legislation, and the even more incompetent Iain Duncan Smith remained unsacked until he chose to betray Cameron by walking out of the government at the most damaging moment possible. But under Theresa May things have become utterly farcical. We had the former Defence Secretary Michael Fallon announce the off the hoof policy that Britain was abandoning the "Mutually Assured Destruction" stance to announce the policy of Britain being open to using nuclear weapons as attack weapons. Not only did Theresa May not sack Fallon on the spot for announcing such a reckless abandonment of Britain's longstanding nuclear weapons policy, she actually let this insane new policy stand. Then Fallon's replacement as Defence Secretary Gavin Williamson embarrassed Britain by saying that "Russia should just go away, and shut up". Theresa May is such a weak leader that once again she didn't correct this nonsense with a firm reiteration of the government's actual position, or ask for Williamson's resignation. Then worst of all there's the Foreign Secretary Boris Johnson, who even set out his own bespoke "Manifesto for EU Withdrawal" in a 4,000 word essay for the Daily Telegraph. This wasn't just the usual foot in mouth blabbering we've all come to expect from Johnson, it was a deliberate and calculated effort to undermine his own government's Brexit negotiating position. Does anyone imagine that strong leaders like Thatcher, Blair, Churchill, or Attlee would have just sat back and done absolutely nothing when their own Foreign Secretary publicly undermined the official party position? Regardless of whether you agree with Boris Johnson's decision to publicly undermine the Tory government by calling for a much harder form of Brexit, or with Owen Smith's decision to break collective responsibility to call for a second EU referendum, it's obvious both needed to be sacked, otherwise we'd end up with rudderless political parties full of ministers who feel entitled to just make up policies as they go along. The reality of the situation is that Teresa May is such a weak and incompetent leader that she allowed a senior cabinet minister to go completely unpunished for brazenly undermining the official party stance. Meanwhile Jeremy Corbyn behaved in the way any competent political leader would when one of his shadow cabinet ministers publicly criticises the official stance of their party in a newspaper column, rather than raising his concerns within the shadow cabinet, or through the democratic apparatus of the Labour Party. 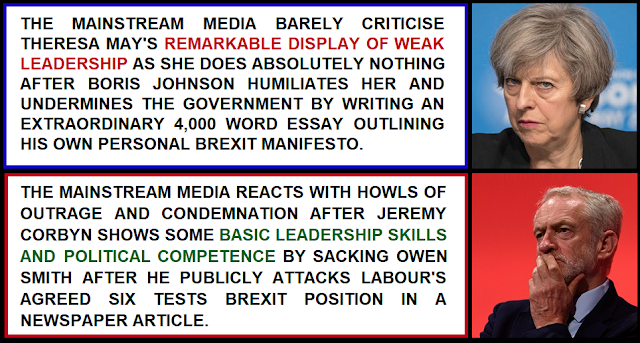 The remarkable thing is that Theresa May's display of weakness and incompetence towards Boris Johnson's absurd display of disloyalty barely elicited barely a whisper of criticism from mainstream media hacks. Then just a few months later we've had to endure howls of outrage from the very same hacks who remained silent about Theresa May's weakness and incompetence after Jeremy Corbyn rightly sacked Owen Smith for timing his attack on the Labour Party position just before the local elections in a calculated effort to do as much damage as possible to Labour's election chances. It's as if eight years of Tory incompetence has done so much damage to the fabric of the United Kingdom that weakness and poor leadership are now accepted as the standard, and any signs of competence and strong leadership are met with furious condemnation and howls of outrage! Regardless of our views on the important issues of the day (Brexit, austerity dogma, wage repression, rising poverty, the productivity crisis, NHS and social care funding ...) surely nobody thinks it's right that modern Britain is a place where unmistakably weak leadership goes almost completely uncriticised, while displays of routine political competence are attacked and derided as being somehow shocking and unacceptable?